Background: β-globin gene transfer may reduce or eliminate complications in patients with sickle cell disease (SCD). LentiGlobin gene therapy (GT) comprises drug product (DP) made from autologous hematopoietic stem cells (HSCs) transduced with the BB305 lentiviral vector (LVV) encoding β-globin with an anti-sickling T87Q substitution (HbAT87Q). The safety and efficacy of LentiGlobin GT in adults with SCD is being evaluated in a phase 1 study, HGB-206 (NCT02140554). Patients were initially treated with DP made from bone marrow harvested (BMH) HSCs (Group A, fully enrolled), then from DP made from BMH HSCs but using a refined manufacturing process (Group B, fully enrolled), and subsequently from plerixafor mobilized HSCs (Group C, currently enrolling). Methods: Adults with severe SCD (history of recurrent vaso-occlusive crisis, acute chest syndrome, stroke, or tricuspid regurgitant jet velocity of > 2.5 m/s) were enrolled. Autologous CD34+ cells, collected by BMH or apheresis following mobilization with 240 µg/kg plerixafor, were transduced with BB305 LVV. After myeloablative busulfan conditioning (area under the curve goal of 5000 [range 4400—5400] µM*min daily), patients were infused with the transduced cells and monitored for safety and efficacy. Summary statistics are median (min-max). Results: As of May 15, 2018, 22 patients had HSCs collected, 18 patients had DP manufactured and 15 patients were treated. Eleven patients (9 in Group A, 2 in Group B) underwent BMH and 12 patients (1 in Group B [who also had BMH], 11 in Group C) underwent mobilization/apheresis. Median of 4.3 (0.1—10.8) x 106 and 10.4 (3.8—21.6) x 106 CD34+ cells/kg were collected per BMH (N=26) and per mobilization cycle (N=17), respectively. Eighteen grade 3 adverse events (AEs) in 6 patients were attributed to BMH and 5 grade 3 AEs in 3 patients to mobilization/apheresis. 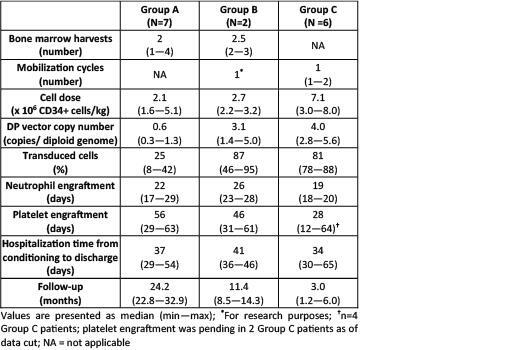 DP and treatment characteristics are shown in Table 1. DP characteristics were improved in Group B and Group C vs Group A. The safety profile post-DP infusion was consistent with myeloablative conditioning and underlying SCD; most common non-hematologic grade ≥ 3 AEs were stomatitis, febrile neutropenia, and vaso-occlusive pain. No grade ≥ 3 DP-related AEs, graft failure, veno-occlusive liver disease, replication competent lentivirus detection or clonal dominance were reported. At last visit (Table 1), HbAT87Q levels were higher in Group B (3.2—7.2 g/dL) vs Group A (0.5—1.2 g/dL). In 4 Group C patients at the 3-month visit, HbAT87Q (4.1 [3.2—6.0] g/dL) levels were equal to or exceeded HbS levels (3.3 [2.8—3.8] g/dL). In 1 Group C patient at the 6-month visit, HbAT87Qwas 8.8 g/dL and total Hb was 14.2 g/dL. Conclusions: These data support the safety and feasibility of plerixafor-mediated HSC collection in patients with SCD. HGB-206 protocol changes have improved LentiGlobin DP characteristics yielding higher HbAT87Q levels. Additional data will determine the clinical effect of increased HbAT87Q/HbS ratios. Disclosure: Markus Mapara - consultant: Incyte. Julie Kanter - Advisory Board member: NHLBI, ASH, AstraZeneca, bluebird bio, Inc. and Novartis; research funding: bluebird bio, Inc., Apopharma, Global Blood Therapeutics, Novartis, Pfizer, and Sancilio. Janet Kwiatkowski - consultant: bluebird bio, Inc., and Agios Pharmaceuticals; research funding: bluebird bio, Inc., Agios Pharmaceuticals, Novartis, Apopharma, and Terumo. Manfred Schmidt - employee: GeneWerk GmbH and German Cancer Research Center; consultant - bluebird bio, Inc.
Alexandra Miller, Francis Pierciey, Weiliang Shi, Jean-Antoine Ribeil, and Mohammed Asmal - employees of and hold stock in bluebird bio, Inc.
Alexis Thompson - research funding: Amgen, Baxalta/Shire, bluebird bio, Inc., Celgene, Novartis, Biomarin, and La Jolla Pharmaceutical; consultant: bluebird bio, Inc.
Mark Walters - consultant: bluebird bio, Inc., Bioverativ, Trucode, Editas, and Sangamo Therapeutics; medical director: ViaCord Processing Lab and AllCells, Inc.
John Tisdale and Lakshmanan Krishnamurti declare no conflicts of interest.